Now keeping aside the healthy vs yummy debate , let us get back to the main topic. 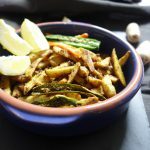 There are a number of ways to make this power veggie , but today I’m sharing a very simple way of cooking arbi. In my later posts as I expand my recipe index, I will keep on adding the other recipes. So coming back , this one is my mum’s recipe, and during India’s hot hot summers, this was a regular at our lunch or dinner times as a side dish with daal (lentils),roti(I preferred paranthas), Onion salad, Mango pickles, raita ,cold lassi.. and yummm sweet cold mangoes..My mouth is watering and I’m feeling nostalgic.Pull me back to the present please!! Ok I’m back.. so this recipe ,you can have it as a starter / snack or as a meal with roti/ chapati /naan and even bread, on one of the days when you don’t want to spend too much time in the kitchen “cooking”.It tastes just as delicious with puri or paranthas and some pickle . This is also a great accompaniment with roti and daal (lentils) specially moong daal. These two (moon daal and arbi) are the best freinds..I know I know… Moong daal is friends with almost all veggies… it is so affable..if I may say so !! But yes.. this one vegetable is quite versatile. This recipe is quite simple , and easy to cook, with really few ingredients. 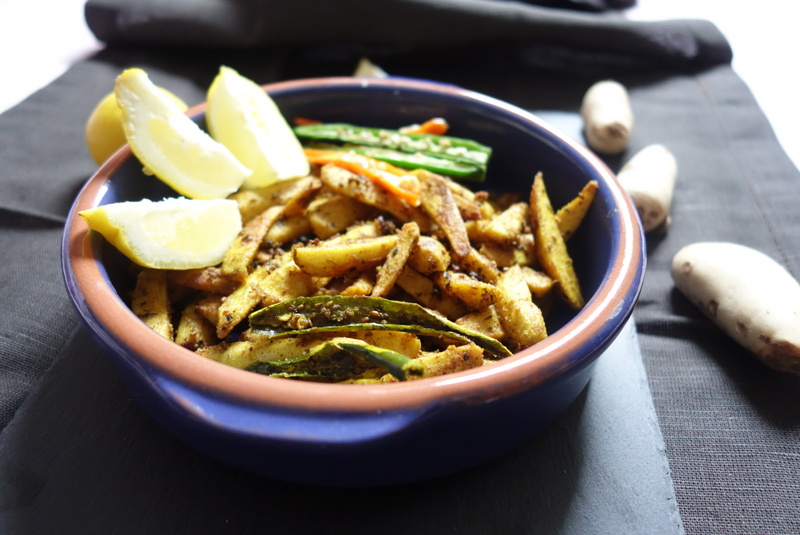 Let’s now get started.Below is the recipe for tangy crispy masala arbi.I hope you like it. Now before you start "handling " taro root/ arbi, there is one thing that you need to keep in mind . Arbi can cause itching in hands, so please apply some vegetable oil on your hands ,before you start peeling and slicing it. Once sliced, rub some salt on arbi and keep it aside for 5-10min . In the meantime gather rest of the ingredients.Then wash the slices properly in cold water and it is ready to cook. Start with heating the mustard oil to smoking point (the colour of the oil will start to lighten). Turn the heat to medium, and add hing(asafoetida), ajwain seeds(carom/ caraway seeds).It will splutter. Keep stirring and add chopped garlic. Saute till the garlic loses its raw smell. Do not brown it, as it will taste bitter. Add the main ingredient - Arbi. Add salt, red chilli powder,haldi (turmeric) powder and dry fenugreek leaves and slit green chillies. Mix everything well and cover the pan .Let it simmer for few minutes on low heat. Open the pan and check if the arbi is done. You can check this with a spoon, if you can just slice it using a spoon/ ladle it is done. Add the amchoor/ dry mango powder and mix well. Now add the besan/ chickpea flour . Increase the heat and mix the flour well with the vegetable. Just let it saute on high heat for 3-4 min , Keep mixing at intervals.Once you see the oil separating, it is done. Now the tangy crispy masala arbi is ready.While serving squeeze a little lemon juice on it. Garnish it with slit green chillies and lemon wedges and serve it as a snack or starter or as a side dish. You must be wondering why so much oil!!! Agreed ,we are going the oil free and the fat free ways , but where oil is required to cook the dish it is required to bring out the flavour, aroma and all the benefits of eating that dish.So use it where required. 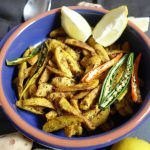 In this case as we are adding the besan/ chickpea flour at the end to make the vegetable crispy, the extra oil helps to blend and cook the flour nicely to give arbi a crispy texture. Mustard oil is most often heated in the pan, with no other ingredients, until it reaches a temperature where the first wisps of smoke appear (about 480°F/250°C). Immediately take it off the heat and allow to cool to a more reasonable frying temperature (around 360°F/180°C) before adding other ingredients. This procedure removes the acrid taste of the raw oil and renders it quite pleasant.